When you are driving, it seems obvious that you should pay attention to the road and to other drivers operating a vehicle around you. Unfortunately, many people become too relaxed, confident and complacent in their driving and begin to focus on things other than the road. When this occurs, these distracted drivers endanger themselves, their passengers, and the other drivers, bicycle riders, pedestrians, and motorcycle riders who share the road with them. Distracted driving accidents are far too common in Birmingham, Alabama, and throughout the rest of the Country. In fact, Distraction.gov reports that 3,331 people lost their lives, and another 387,000 people were injured in distracted driving crashes in 2011 alone. Those who suffered injury or lost loved ones know that these numbers are more than just a statistic; there is a very real cost involved with distracted driving crashes. At Hollis Wright, our dedicated Alabama automobile and motor vehicle accident lawyers are dedicated to helping ensure that the person responsible for the crash covers your economic and non-economic losses and damages. Distracted driving includes a number of different behaviors, including texting, talking on a cell phone, taking care of children, adjusting in-vehicle controls, personal grooming, eating, watching movies, smoking, talking to other passengers and reading maps or other materials. Any time you are focused on anything other than the road or the vehicles around you, you pose a hazard and danger to yourself and all others on the roadway. Statistics that have been gathered serve to underscore just how rampant distracted driving is on our roadways and streets. Any of these primary forms of distractions are dangerous and can result in a significant automobile accident. If you or a loved one have been in an accident involving a distracted driver, then you need to contact the accident attorneys at Hollis Wright attorneys so that your individual circumstance can be fully and completely evaluated. If a driver causes an accident due to his or her failure to stay alert and focus on the road and surrounding vehicles, then the driver can be considered legally negligent and held responsible for all costs associated with the crash. This includes medical costs, lost wages, pain and suffering, emotional distress, permanent impairment and any disfigurement. The Hollis, Wright, Clay & Vail, P.C. accident attorneys attorneys are committed to representing people who suffered serious injuries from car accidents. 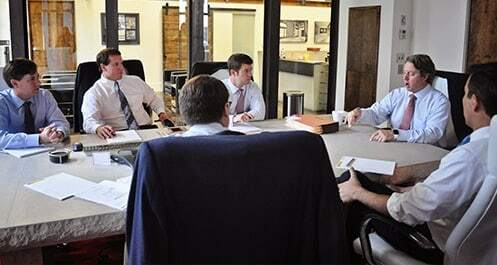 Our attorneys have more than 100 years of combined experience representing accident victims. We know how to build a strong case and to convince insurance companies to offer you a full and fair settlement. We also have demonstrated a track record of success in the courtroom by winning significant verdicts. Using our extensive skill and experience, we routinely represent individuals who sustained a wide variety of injuries that resulted from the careless and negligent acts of a distracted driver. Our clients often suffer from traumatic brain injuries, paralysis, spinal cord injuries, broken bones, herniated disks and significant orthopedic injuries. If you or a loved one has been involved in an accident involving a distracted driver, the Alabama Car Accident Attorneys at Hollis-Wright can help. Our experienced attorneys have handled many distracted driving cases and we know how to help you get the evidence you need to prove your claim. Call us now toll free at 844-529-8255.